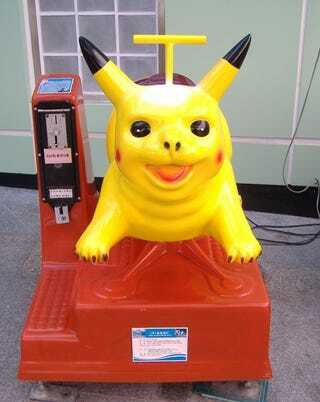 In Japan, coin-operated Pikachu buggy rides are a common sight in front of arcades or suburban shopping centers. Children love them. In South Korea, they must scare the crap out of kiddos. These South Korean takes on Pikachu were spotted by blog Koya Log Everyday in South Korea. The Pikachu buggy ride below is the real deal and does not strike the fear of god in small children. Hit the link below for more Pikachus, including the truly horrific blood-red head one. The horror!